The assignment sounded simple but being a portrait photographer, photographing office furniture doesnt sound quite as exciting. Unless, of course, the furniture is on the cutting edge of industrial design and you can place it in a very cool and trendy office environment with plenty of natural light. Well, it doesn't always work that way. The following shot looks like it was taken with plenty of natural light but as you might have guessed already, when you have severe back lighting as it was the case with the large window in the background, the bookcase should have looked quite dark. Enter the Bees! Using a B1600 with a medium foldable octabox as main light placed at camera right and aimed almost straight towards the bookcase to illuminate the compartments and binders, along with an SB-900 with a translucent umbrella set to SU-4 to illuminate the side opposite to the window light. Also used the Expodisc to set a custom WB, which would allow everything to look like actual natural light. I added the blurred background in Photoshop to put the emphasis on the bookcase. 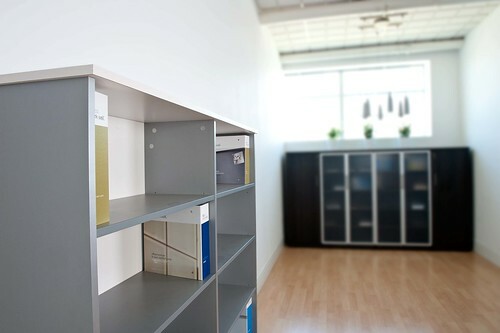 If you are looking for quality used cubicles, office seating, desks, credenzas, filing, used office furniture and conference room and lobby furniture, we can provide as-is, ready to install used office furniture at a fraction of the cost of used office furniture.